GE Refrigerator is Clicking? - You Can Fix It! If your GE refrigerator is clicking then it is likely a sign of a more serious issue. Generally, the clicking comes from the main controller board, the brains of the refrigerator. Most likely the GE refrigerator will soon stop cooling, you’ll hear a howling sound or the main control panel will go blank. Fortunately, there is a fairly simple and inexpensive fix. The main control board has been improved, available for purchase on Amazon for about $140 and is super easy to replace. 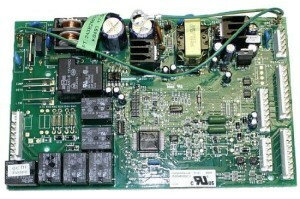 I was able to replace this on our GE refrigerator controller board in just about an hour and it is as good as new! Fortunately, Amazon makes it easy to find the right part as most of the older refrigerator main boards, including WR55X10552, WR55X10656, WR55X10335 have all been replaced by the new and improved controller board, WR55X10942. Here is a great video on the replacement of the GE refrigerator control board. While this fixes the GE refrigerator clicking issues for most people, let us know if this worked for you (or not) in the comments below so we can help each other fix these annoying problems! My water/ice dispenser arm is NOT clicking when pushed, and I am not able to get ice or water from the dispenser. The electricity works, meaning the lights on the controls light up when pressed, it’s just when I press the dispenser arm, there is no sound of connection with power. Can I fix this?